CHILDREN of war veterans yesterday demonstrated at the United States Embassy in Harare against the illegal sanctions imposed on the country. The Patriotic Forum for Zimbabwe Children of National Liberation War Veterans Association (PF-ZCNLWV) was formed in July as part of efforts to reinforce and safeguard the gains of independence. The organisation’s organising secretary, Cde Julie Chiondegwa, was yesterday afternoon taken to Avenues Clinic after she collapsed during the demonstration. 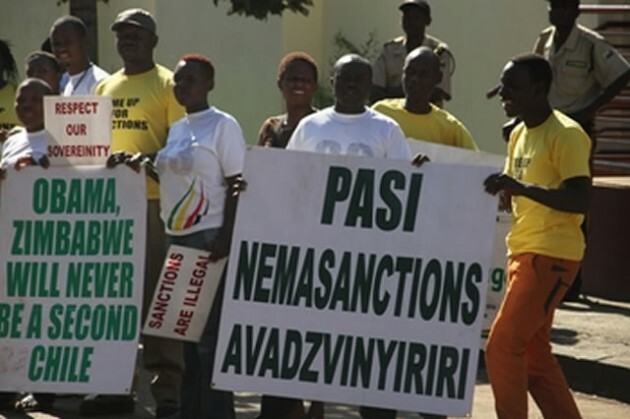 Secretary-general Cde Knowledge Kadzura said they gathered at the embassy as early as 6.30am yesterday to express their displeasure over the US foreign policy for regime change agenda through illegal sanctions. “We recently wrote a letter to the US Ambassador to Zimbabwe, Mr Bruce Wharton, informing him about the unfulfilled pre-election promises by his country with regards to the removal of sanctions,” said Cde Kadzura. He said they would today (Friday) carry out a “full demonstration” with over 300 youths in the city. Cde Kadzura said the illegal sanctions had put the economy under siege with major international co-operation pulling out, investors barred from investing and causing untold sufferings to the ordinary people. In their letter to Mr Wharton, the organisation said Zimbabwe like the rest of Africa was in need of strong investment in infrastructure, energy projects, and rail roads, among others which were key to economic resuscitation.